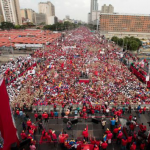 ON THE FALLACY OF CALLING VENEZUELA ‘A DICTATORSHIP’ – In the Telesur interview below, the professor and researcher Matias Bosh Carcuro analyses the recent situation in Venezuela where the right-wing takes to the streets in support of vandalism and violence. How would a dictatorial regime handle the start of violent protests ? According to the MUD’s leaders and the big transnationals of information, there is ‘a dictatorship in Venezuela’. This view is also shared by Luis Almagro, General Secretary of the Organisation of the American States (OAS). The latter wants to have Venezuela declared in official breach of the Constitutional order. To begin with, one must tale the notion of ‘dictatorship’ with a pinch of salt. Simon Bolivar could be a dictator, but nobody says that he should have been overthrown because of it. The dictatorships of Latin America, and what is known of their importance, hark back to the 20th century – its second half particularly. Many have been the Latin American countries that showed no tolerance for dissidence or divergence. Their governments or leading groups would keep absolute power for themselves, with large-scale violation of individual rights as a result. Where this happened, no group of opponents ever could stand in elections, let alone win them. There was no way for opponents to become recognised or enter public posts. [But in Venezuela today], the opposition can be found in public roles. It can create parties, have newspapers, TV channels, etc. When Lilian Tintori wants to pass for Luther King’s wife, she forgets that Luther King never called for government overthrow, whilst [her husband] Leopoldo Lopez does. And Leopoldo Lopez has not been murdered by a hitman, but Luther King was. Far from what happened to Luther King, Lopez has had a transparent trial, in conformity with the law. What happens right now in Venezuela is not the same as what you see happening in Chile or New York. There is no resemblance. See how the police behaves in Chile or New York without anybody calling Bachelet (Chile), Obama or Trump ‘dictators’. In Mexico, Colombia and Honduras, political activists are murdered every week, but no accusation of ‘dictatorship’ is levelled against their governments. This particular accusation is reserved for the government of Venezuela. But to qualify the government of Venezuela of ‘dictatorship’ shows complete machination and double standards. To me, it is also a lack of respect for the countless thousands who endured the dictatorships of Latin America – them and their families – who suffered torture, exile and execution. A very far cry, this, from the way Capriles, Borges, Ramos Allup and Tintori are being treated in Venezuela. Tintori got herself pictured with some presidents – whilst in Chile, the widows of those who were executed for their political beliefs are still looking for the bones of their loved ones in the sands of the desert. Why aren’t the leaders of the opposition trusting the Venezuelan government’s calls for dialogue, particularly since mediators are available from the Vatican, from foreign ex-Presidents and from organisms like UNASUR? The leaders of the opposition cannot give their trust. If they did, it would essentially mean that they accept the rules of the democratic game. The first to reject those rules was Henrique Capriles himself. That was in 2013, when he said that the elected government [of Maduro] was ‘illegitimate’. He called on the soldiers to rise and on the population ‘to unleash its rage’. This led to the ‘guarimbas’ of 2013, and then to those of 2014. The MUD leaders do not believe in the rules according to which you accept to lose as much as to win. They do not accept the rules and the institutions. They are not able to discuss what would happen if they accepted the rules. They don’t want to consider that win or lose, within the rules, an eventual understanding develops, along fluid channels of cooperation and collaboration inside the powers of the State and the political administrations. The MUD opponents are not prepared to discuss. They did not accept Chavez. They do not accept the revolution, and they reject Maduro above all. For them, Chavism is a nightmare. They want it erased from the history of Venezuela. They want to keep the privileges they have always enjoyed. They feel entitled to these “by divine right”. This makes you wonder how a part of the population can still believe in these people having any democratic or political credibility. They have no credibility. They presided over the crimes of the IV Republic. Their methods are those of the State coup which they carried out in 2002 against Chavez. If they still impress some Venezuelans, it is because an economic and commercial crisis has developed, these last 2 years. But they banked on this crisis, and now they ‘weaponise’ it. Had they been in government, matters would have been much worse for the people. Everybody knows this. If the opposition stays in the streets, is it possible to envisage the Government stepping down? Nicolas Maduro and the Government are not about to step down. Impossible. This would violate the Constitution and the rule of law. It would grant to those of the MUD a political right which they do not have. If they want to gain the Presidency, let them stand in the 2018 elections. These kind of people are putschist, in Venezuela and in the whole of Latin America. It is not true that they believe in the Constitution and that they respect it. They keep telling tales. They are today the same as what they were in 2002. They want the Government out. They want to bring down all the public powers and Constitutions. They want to scrap everything that reversed the pre-2000 order; the order that always returned Elite Governments. With such Governments, the wealth of the country was always for the few. 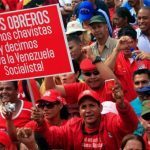 Workers demonstrate in Caracas on 28.10.16 in support for the Maduro government. The Maduro government will not allow the return of these people. No way. If today’s problems were of a kind that [our] stepping down could resolve, they would be simple problems indeed. Today, the fight between MUD and the government is not about the lack of basic goods and medicines. It is about the choice of society. In the matter of social model, there is nothing to learn from people like Capriles, or from Macri in Argentina. Observe how Lilian Tintori supported Guillermo Lasso in Ecuador. Those who lead the MUD believe that power was invented for them. This is what they want; but when it comes to the political crisis facing the country, there is no lack of electoral means to solve it. The MUD’s opposition is a smokescreen. If its leaders want to impose their project, let them stand candidates in the 2018 elections. Let them convince the majority of the Venezuelans. Let them compete for the vote in total transparency. There is no reason why the people and the government should give them power on a plate, even if they think that they merit it, “by divine right”. Why aren’t the ‘guarimbas’ condemned abroad? Why do foreign countries oppose vandalism when it happens to them, but call it heroism when it happens in Venezuela? As I was saying, the double standards in this matter are terrible. There are political prisoners in Chile and Argentina. Black people keep being killed in the United States. Nobody is talking about them. When political activists demonstrate in Spain, and elsewhere in Europe, they get clobbered over the head for having done no wrong of importance compared with what the hooded guys get up to in the streets of Venezuela. The reason for this double-standards is that the media corporations defend the corporate interests, supported by enterprises of mass manipulation. They want to say that Venezuela has failed. And that it is a bad example. They also want to whip-up the conditions to justify a State coup. A calamitous situation faces the Rights of Man throughout the continent. In Mexico, Brazil, Colombia, Honduras, Guatemala and the Dominican Republic, what are the police-forces and the paramilitaries up to? What is happening to the Mapuches in Chile? We want to show that free expression is not repressed in Venezuela. And that violent actions are being perpetrated today in Venezuela by the same groups that were already acting like this in 2012. The perpetrators of these violent acts turn everything moving into a social crisis. They have well researched plans and execute them skilfully. It is a wonder how they manage to turn their attacks on people into indictments of revolutionary democracy. This is why we give great importance to the need to have every truth publicised, as soon as it gets discovered, via the social networks and medias. This is our way to help those abroad [who are being lied to]. 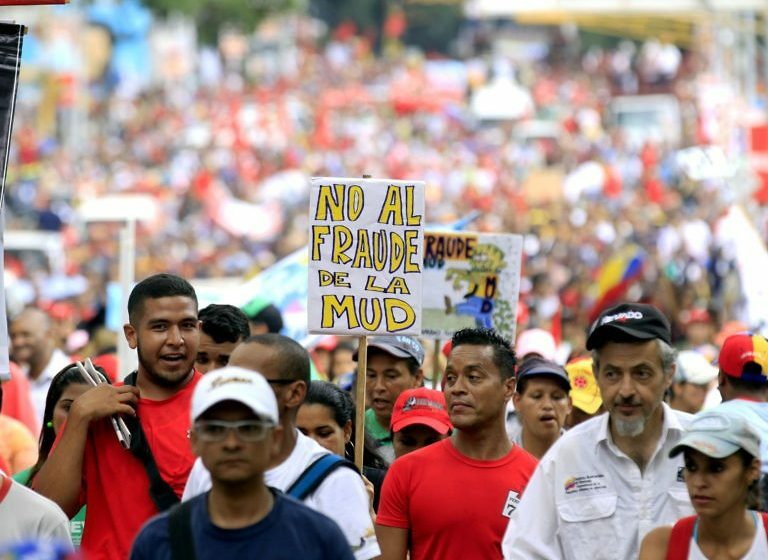 The MUD is an electoral coalition of parties of the right-wing in Venezuela. It stands for Mesa de la Unidad Democratica. 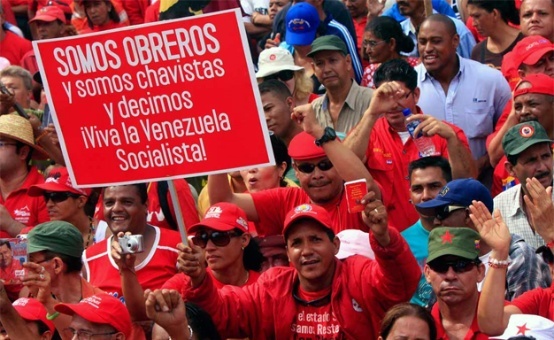 It was set up in 2008 to oppose Chavez’ newly created PSUV (United Socialist Party of Venezuela) and to stand against it in the 2010 elections. Lillian Adriana Tintori Parra, born 1978. Presenter for private TV and Radio channels. Wife of Leopoldo Lopez, she campaigns for the release of the counter-revolutionaries (like him) jailed under Chavez and Maduro for ‘inciting violence’. Leopoldo Lopez Mendoza, born 1971. Jailed ‘for inciting violence’. Born in a family linked to the oil sector. Misused public funds. Took a leading part in the failed attempt to overthrow Chavez in 2002, when he collaborated with international business and US-backed Venezuelan soldiers to try and drag Venezuela back down under the control of international finance capital. Henrique Capriles Radonski, born 1972 Caracas. Governor of Miranda. Originally Christian Democrat of COPEI. Rejected the 2013 election results that brought Maduro to presidency. COPEI is now part of the MUD. Julio Andres Borges, lawyer and right-wing politician. Born 1969. Involved when violence erupted in the National Assembly in 2013. Now president of the National Assembly. Seeks to regroup the right-wing of Latin America to replace UNASUR. Henry L Ramos Allup: Lawyer, born 1943. Joined MUD in 2008. Became vice-president of the Socialist International in Aug 2012. Lillian Tintori got herself pictured with the right-wing leaders Pinera of Chile and Pastrana of Colombia outside the Ramo Verde, military prison, demanding the release of counter-revolutionaries. The Guarimbas were street attacks perpetrated by masked individuals opposed to Maduro winning the elections in 2013. They would burn tires, rubbish and buses, trash entire neighbourhoods; and when people would come out to clean up, they would attack them. In Merida, Gisella Rubilar was shot when she went out to pick up their rubbish. Other forms of killings took place, and continue today. When the international media reported 43 dead recently, they did not say that many of the dead were Maduro’s police officers and ordinary workers. Nicolas Maduro, Born 1962 Caracas. Bus driver, then Trade Union leader, then MP in 2000. Elected president in 2013. Protests started then, and continued throughout 2014, leading to right-wing riots. This continues to this day. 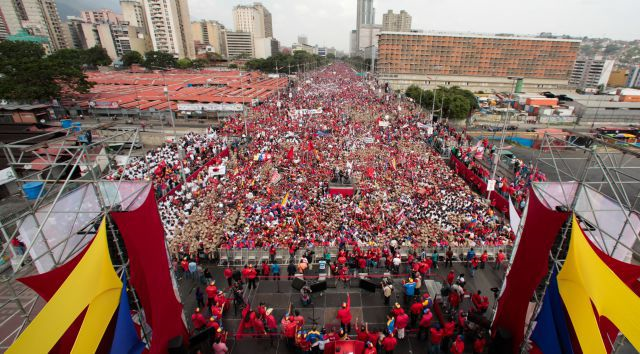 Maduro enjoys the support of the mass of the population, of the Supreme Court and of the military. The IV Republic lasted from 1958 untill 1999. Two organisations: PROVEA and American Human Watch (USA) reported that total disregard for human rights and dignity “were the rule in Venezuela’s jails during the 40 years of the IV Republic”. In the recent presidential elections in Ecuador (3.4.2017), the pro-imperialist and neo-liberal Guillermo Lasso stood against the left-wing nationalist Lenin Moreno. When Moreno won, Lasso initially refused to stand down. In Venezuela, MUD was hoping he would resist. Tintori went to show Lasso’s supporters how to make trouble for the nationalist revolutionary process in Ecuador. On 18 March 2017, a large demonstration of Mapuche indigenous people took place in Chile against police brutality. 10% of the Chilean population is Mapuche, i.e. 1.5million. In December 2016, a young chap, Brendon Hernandez, 17 years of age, was shot by police in the back. The Chilean prosecutors declared this to have been an accident.